Bulging discs in the lower spine present a common form of back pain that is not easily resolved with surgery. For the first time supplementation with chondroitin and glucosamine is reported to resolve low-back pain, with relief of symptoms starting after 6 months and evidence by MRI (magnetic resonance imaging) serving as visual proof. The water content of each disc in the spine is a reliable measure of degeneration and regeneration. Water is held in the disc by a molecule called hyaluronic acid, which is produced by fibroblast cells throughout the body. Hyaluronic acid, which is comprised of two sugar-like molecules (glucosamine + glucuronic acid) holding hands, exists in the gooey connective tissue outside of cells. 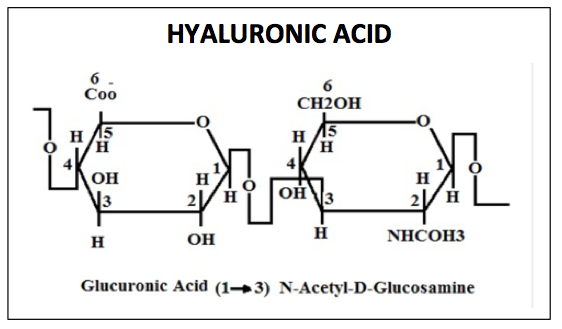 Hyaluronic acid (HA) is the great water-holding molecule of the body. Estrogen stimulates HA which is why females have smoother skin, thicker hair, and exhibit greater flexibility than males. It is HA that makes the tissues in a young woman rubbery so tissues will stretch so a newborn baby can squeeze out of a woman’s womb. The supplement regimen consisted of 500 mg glucosamine and 400 mg chondroitin daily. 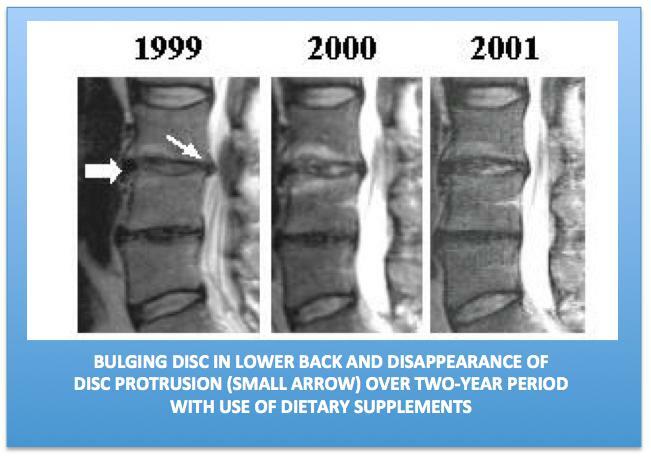 The 56-year old patient, who had experienced back pain and lack of flexibility for 15 years, had less bulging and protrusion of the disc in his lower back and relief of symptoms after 2 years of supplementation. The photographic evidence is compelling. This author would suggest use of supplements that provide HA + glucosamine + chondroitin or preferably use of HA with quercetin, a plant molecule that inhibits the enzyme (hyaluronidase) that degrades hyaluronic acid.